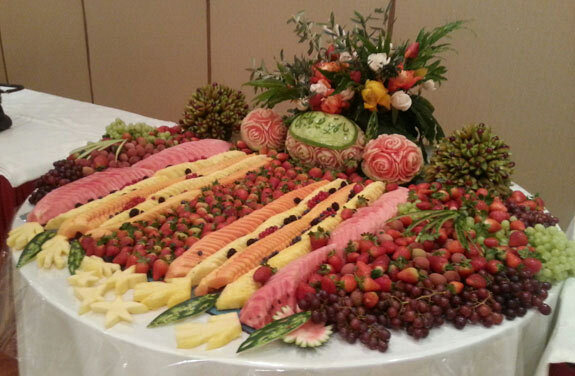 In this post, you are bound to get some great ideas for fruit carving displays for weddings. 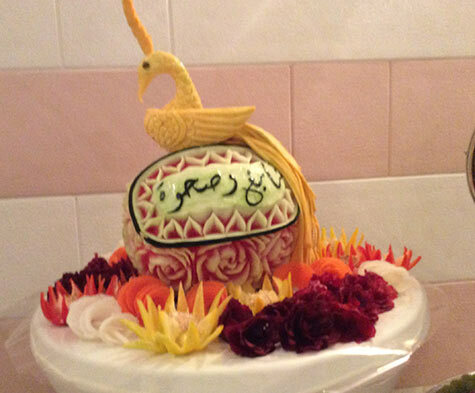 In my last blog post, I featured the wedding carving arrangements created by one of my student /customers Saada Al- Taie who has a fruit carving and decorating business in Oman. After gaining more experience than she had when the photos in the previous post were taken, she has created even more beautiful wedding displays. Her photos that I will share with you in today’s post are even prettier than those in the last post. I hope these will give you some inspiration. Of at least have you enjoying a few ooohs and aaaahs. Saada did a really beautiful job carving and arranging this lovely wedding display. 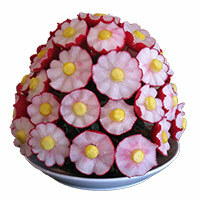 It contains beet and turnip roses, and long carrot flowers around the watermelon rose centerpiece. You can learn to carve watermelon roses in my Carving Watermelons, Roses, Buds and Leaves lessons. 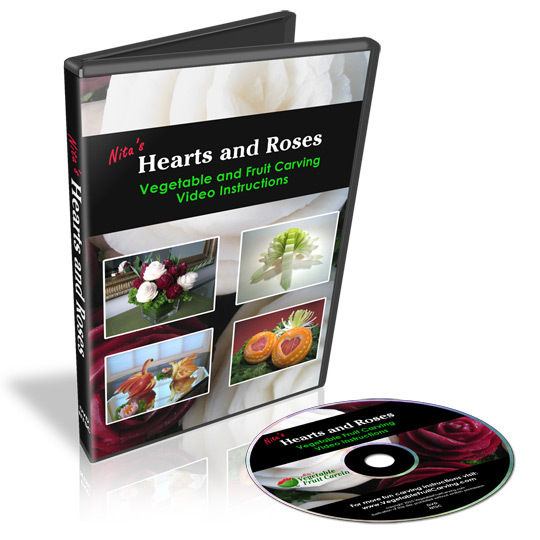 Beginner beet roses are taught in my Hearts and Roses lessons. 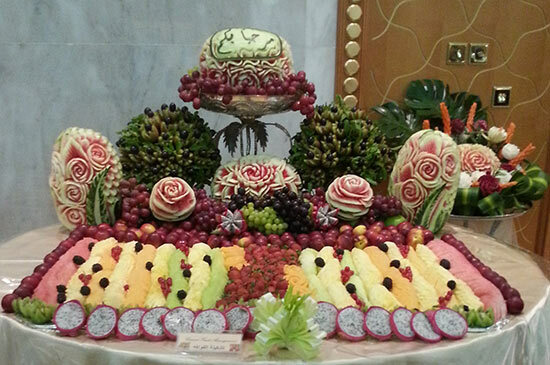 This colorful display at a wedding features multiple watermelon carvings arranged at various heights behind a pretty display of fruit slices. If you are wondering about the pink fruit with the black and white spotted middle, that is dragon fruit. You has see kiwi bouquets in the background. To get a better look at the kiwi bouquets shown in the background in the photo above, click here. 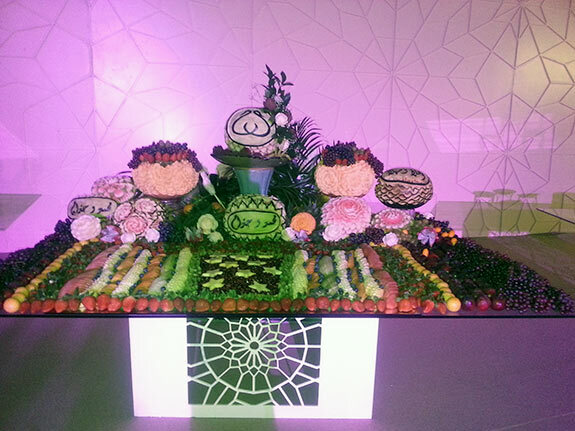 This decorative fruit carving display was set on a high table to dress up the space. 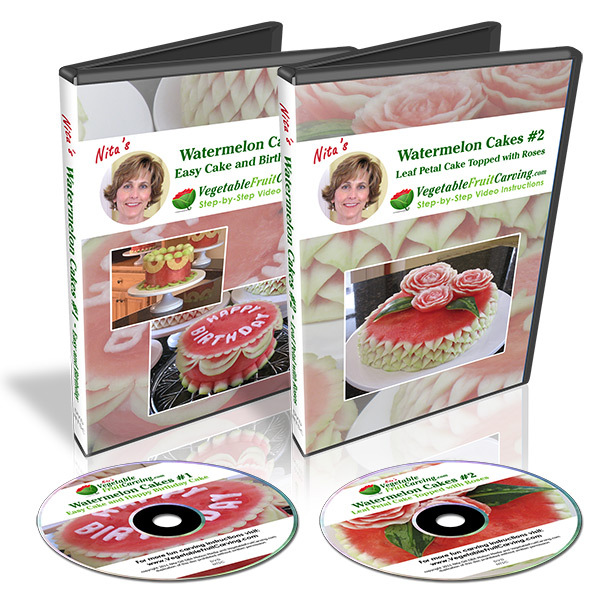 You can learn to carve a watermelon cake like this one in my videos lessons, Watermelon Cakes #1 and #2. 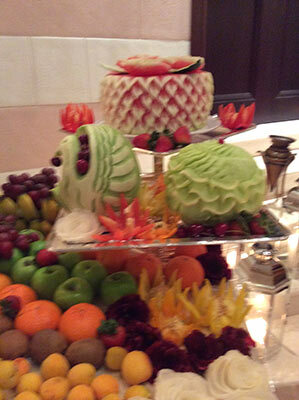 Another of Saada’s pretty fruit carving displays for weddings that serves double duty. Its both decoration and food for the guests. Again, she feature multiple carvings arranged at various heights to make an awe inspiring visual impact. Another wedding fruit table with a modern flair. 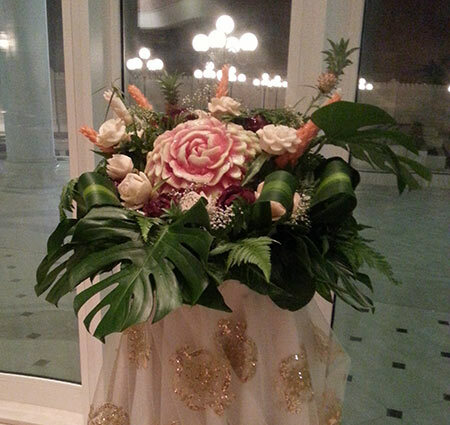 Saada carved her first pumpkin roses for this lovely wedding display. See below for a closer look at a couple or the carvings in this display. Closer look at Saada’s first pumpkin (kabocha squash) carving. Beautiful isn’t it? The symbol in watermelon is a name of bride and groom in Arabic which you can read in vise versa. and were put in a card on invitees. another name which were front is a welcoming word which I have written in Arabic. 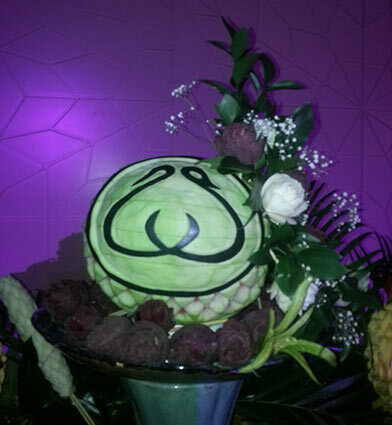 Closer look at the elegant Arabic carved watermelon that was part of a fruit carving display for this wedding. I don’t know if this is the welcoming word but it looks beautifully carved and elegant. You can learn to carve words and graphic patterns onto watermelons with my video lessons, Carving Letters and Words #1 and #2. 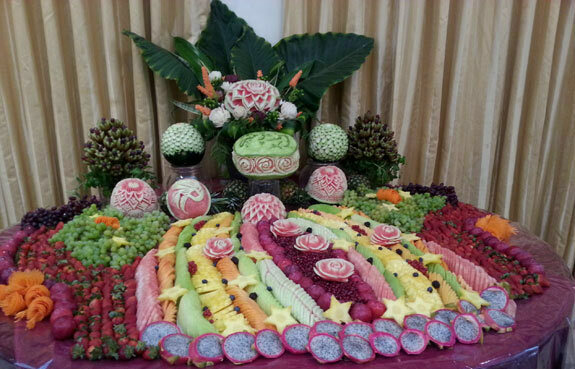 This next photo is a bit out of focus but I’ve included it because it demonstrates the use of various whole fruits, using tiers of different levels to display the carvings and it’s topped with a beautiful carved watermelon cake. Watermelon topped with a carved bird. The yellow bird and yellow and orange peppers add brightness to this display. 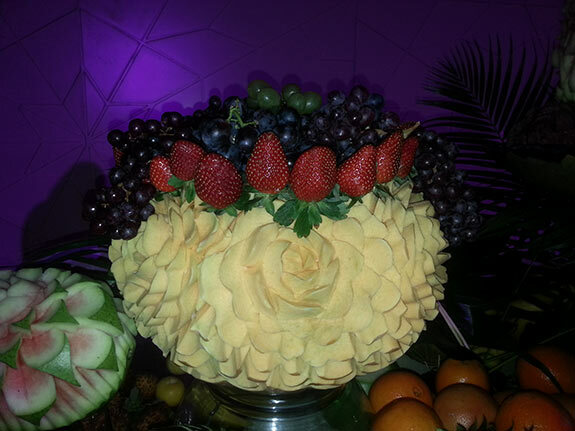 Saada did a truly beautiful job on all of these fruit carving displays for wedding. I appreciate her sharing her photos with us. And I hope you got some ideas that you might be able to use for your fruit carving displays for weddings or any other special event. You’ll find many of the lessons where Saada learned her carving techniques here. Beautiful pictures. A lot of innovation. 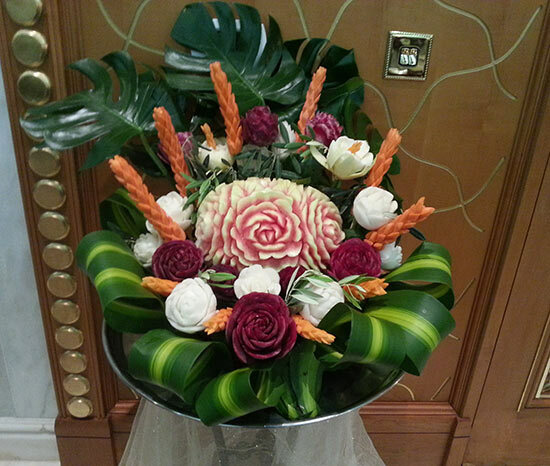 I especially like the kiwi bouquet.